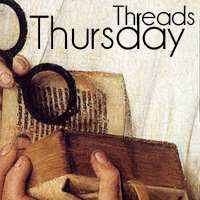 Historical Tapestry: Thursday Threads - Where are you in HF? Thursday Threads - Where are you in HF? 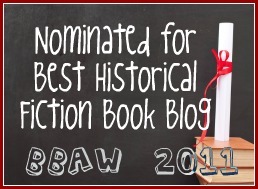 Where in Historical Fiction are you reading at the moment? Julie - At the moment I am reading The End of Your Life Book Club by Will Schwalbe, so I am not currently reading any historical fiction. The next book for my book group is Inheritance by Nicholas Shakespeare which is set in Australia in 1960. I'm reading The Kingmaker's Daughter by Philippa Gregory. Working on finishing writing what I started for NaNoWriMo. ;) Not reading anything currently, but the last I read was Third Book of Pantagruel by Francois Rabelais. If you can call it HF, as it's an actual 16th century novel. I really enjoyed reading it, and can recommend to all readers, who don't object obscenity, use of "colorful" language & excessive consumption of alcohol. ;) Rabelais wrote a series of Pantagruel the giant, I've read the first of them and this one, don't think the other have been translated into Finnish. They were hugely popular in their time, read both by nobility and ordinary people. I usually do not drop many responses, but i did some searching and wound up here "Thursday Threads - Where are you in HF?". And I do have 2 questions for you if it's allright. Is it only me or does it look as if like some of these remarks look like they are written by brain dead people? :-P And, if you are writing at other places, I would like to follow everything fresh you have to post. Would you list of every one of all your social pages like your linkedin profile, Facebook page or twitter feed? I'm reading Stone Lord by J.P. Reedman. It's Arthurian legend set in the Bronze Age. It's one heck of an amazing and evocative book.